The train was crowded. Even the first class compartment was full. He had to stand in the passageway, sometimes being pushed by people around him. It irritated him. He already had a bad day at work and now he was being pushed around by sweating and stinking people. He had no right to complain actually, he was sweating and stinking himself. He managed to control his frustration of being pushed around but he found it difficult to keep his anger in check because of the way people were 'not' looking at him. They were avoiding eye contact for a reason. Suddenly, he noticed her through the grill separating the gents and ladies first class compartment. She was the only person who was looking at him. He stared back at her hoping that she would be scared and would look away. But she continued staring at him. She was listening to music, he could see the earphones. A frustration crease appeared on his forehead but the girl did not look away. She smiled after a while and his heart missed a beat and his stomach did a somersault. He could not believe anyone could smile looking at him. He used to be handsome before but the mishap at the factory where he used to work had ruined his face. There was an ugly scar on his face, extending from the bridge of his nose across his left cheek to his jawline, partially affecting his eye. The doctors said he was lucky that the damage to the eye was not extensive and he still had vision in his eye, though not 100%. The accident had been sort of lucky for him. He was promoted. It had helped to make him financially secure but the scar had ruined his personal life. His wife had left him. She had told him staring at his ugly face for the last time that it was beyond her capacity to be able to see his face first thing in the morning. She found it difficult to be able to kiss him even with closed eyes. Hence he was obviously surprised when the girl did not look away, in fact she smiled at him. He smiled back, continuing to look at her. After a few minutes the train stopped at a station and the girl got up. He watched as she opened her purse and took out something. The girls standing at the entrance made way for her. Then, with one swift movement she opened the blind person's stick and stepped out of the train. He felt a weird pain in his chest. The only person who had dared to supposedly look at him was blind. He bent down and looked out of the window to check which station she had got down at. He could not sleep that night, he lay awake in bed thinking. He kept seeing her face every time he closed his eyes. He could not push aside the image he had captured in his mind. Her mesmerizing eyes haunted him. He had never felt like this before. He could not resist the desire. He had to know more about her. The next day he climbed into the train hoping to see her again. He found her sitting at the exact same place. He stared at her and she stared back at him. Even though he knew that she could not see him, it felt good to look into her eyes. When she got up to go, he rushed towards the entrance of his compartment and as the girl climbed out. He climbed out as well. He followed her, maintaining a safe distance. He wanted to talk to her but he could not gather enough courage. 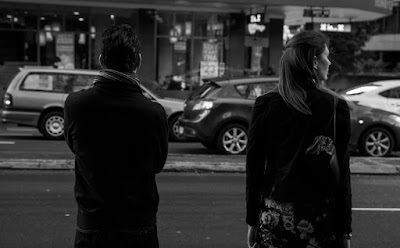 He walked behind her as she stepped out of the station, crossed the street and continued walking. He saw her walking past the gate of working women's hostel. Then he took a bus to reach home. He followed this routine every day. He waited for a chance to talk to her but he could not dare. One day as he followed her out of the station and she was about to cross the street he saw that she had miscalculated the timing and the signal for the pedestrians had turned red. Vehicles came speeding in their direction and he had to give up on his silent company. He held her arm and pulled her towards him. She lost her balance and her head hit his chest. Instinctively he wrapped his arms around her and steadied her. After she was steady on her feet she asked, "You are the same man who keeps following me every day, aren't you?" He was surprised. He could not reply. "Are you not aware that the other senses are heightened in blind people?" she continued. "Yes, I am him. I do not mean any harm." he responded. "I know. I can sense trouble. I am still not sure why you follow me every day?" she questioned. “I cannot answer that question either.” He told her the truth. She smiled. His heart missed a beat once again. He had never seen such a beautiful smile. He had never seen any smile for a long time. He did not remember when was the last time he had seen his wife smile? Actually, his ex-wife who had ran away from him and into the arms of another man the first chance she got. “There’s a restaurant nearby, we can go and sit there for a while.” She said. She continued, “My friends would have a heart attack if they come to know that I offered a stranger to take me to a restaurant. Forget that – they will have a heart attack if I tell them I spoke to you.” and laughed. He joined her. Laughing felt good, laughing with her felt good. After a while she extended her hand for him to hold. He took her hand in his and they crossed the street. He took her to the restaurant she had mentioned and they had coffee. Then he walked her to the women’s hostel. They met every day. He did not tell her that the station he got down at, was not his station and he had to travel again by bus to reach his house. She did not ask him any personal questions and he refrained from prying into her personal life as well. He was happy and satisfied with what he got. He wanted her company, even if it meant only for some time. He needed to feel someone’s eyes on him even though the person could not really see him. He did not know what she wanted from him. May be she wanted his company just the way he wanted hers. One day as they were sitting on a bench in the park near the women’s hostel, she reached out to touch his face and he moved back involuntarily. “I want to feel it.” She said. He was shocked to find out that she knew about the scar. How was that possible? He asked himself. He had never mentioned the scar to her. He was speechless. He found it hard to believe that she had known about the scar, she had known that he had been following her, he who was a complete stranger – dangerous looking stranger and yet she had placed her life in his hands. “I am in awe of you.” He managed to say as he choked on his tears. She noticed the tremble in his voice and she moved closer. She raised her hand again to touch his face but hesitated to actually touch him fearing that she would scare him away. He held her hand in his and directed it towards the scar. She ran her fingers over the scar and the affect of her touch spread through his entire body; he felt good as calmness spread throughout his body and his mind. He closed his eyes as she continued touching the scar and for the first time he felt better, the scar on the face did not bother him in fact it felt good. When he opened his eyes he saw that she had come closer, her face inches away from his. He realized that she was about to kiss him and he parted his lips to welcome the kiss, instead she kissed the scar, starting from the bridge of his nose across the cheeks and towards the jawline. She tasted the salt of his tears as he continued crying. Then, she placed her lips on his lips and he tasted his tears as they kissed.